Big Muff PI, Fuzz pedal from Electro-Harmonix in the Big Muff series. 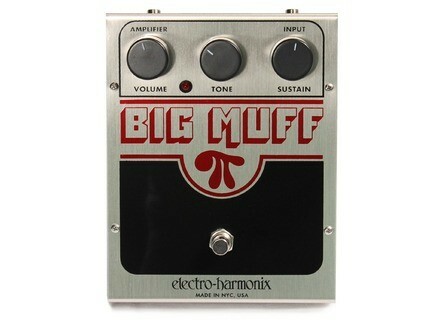 MGR/Cain Man's review"Electro-Harmonix Big Muff"
I bought this pedal brand-new for $59 bucks at Sam Ash. Throughout my playing years I've always looked for a distortion pedal that was heavy and thick. I used a Boss Turbo Distortion for many years because that was the closest distortion that fit my criteria. Recently I read a couple of articles in which Big Muff Distortion/Sustainer was mentioned. I decided to buy it, and I'm so glad I did. I really love the distortion - period. It's the type of distortion I've been looking for forever. The pedal looks great and is very simple to use. If you like heavy, thick, and warm distortion, this pedal is for you. I still can't believe I found the pedal of my dreams. The only thing I don't like about it is that it is powered by battery only. You can't plug an adapter to it - but who cares. This pedal is so well constructed that I think it's going to last for many years and still look great. It's very good looking pedal. This pedal is the best distortion pedal I have used and, believe me, I've used many different ones. 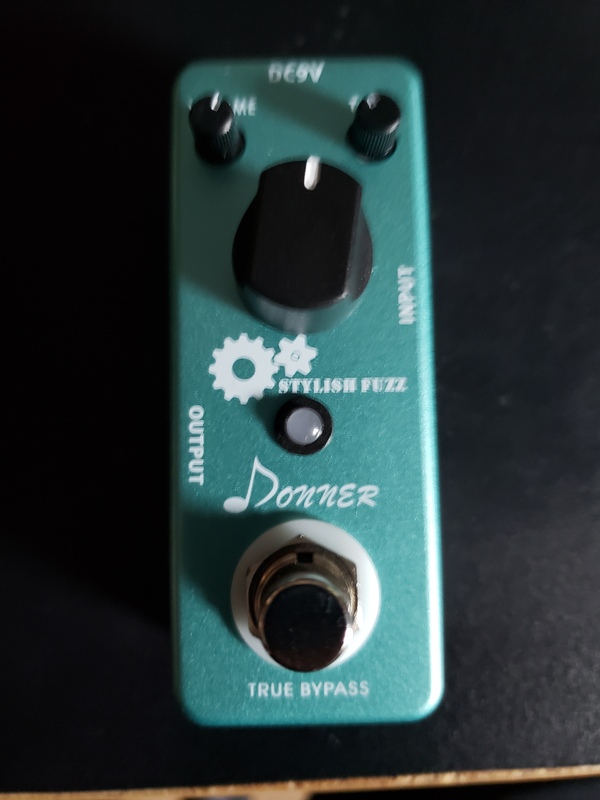 I bought this pedal from shopoftheworld.com (has a good selection and delivers quickly in the UK) for £62.00 [88.10 EURO]. I bought it because I was looking for a good distortion and heard that bassists such as Cliff Burton (Metallica), Chris Wolstenholme (Muse) and others used this pedal. Although this is designed to be a guitar pedal, it works GREAT on bass, in fact it keeps some of the lower tones (even on a five string) equal with the rest better than some bass distortions I have tried. This pedal has 3 controls, (Volume,Tone,and Sustain) which can be used to create a great sound that fits perfectly with a guitarist distortion, and is also great for any bassist in a heavy band looking to play distorted solos and if can really cut through if the tone is pushed. No major complaints, one thing that is a bit of a downside is the fact it is quite load on bass. There is some noticably background noise, but this is to be expected as this pedal does boost volume a lot. This, as all EHX pedals is built like a rock. Strong, heavy and theres no chance of the control knobs causing any problems. The wiring on the inside is a bit messy (lots of wires with a lot of slack). But this is obviously not a major flaw as I have played this pedal for about 2 years now and despite quite a lot of abuse, is still working fully. 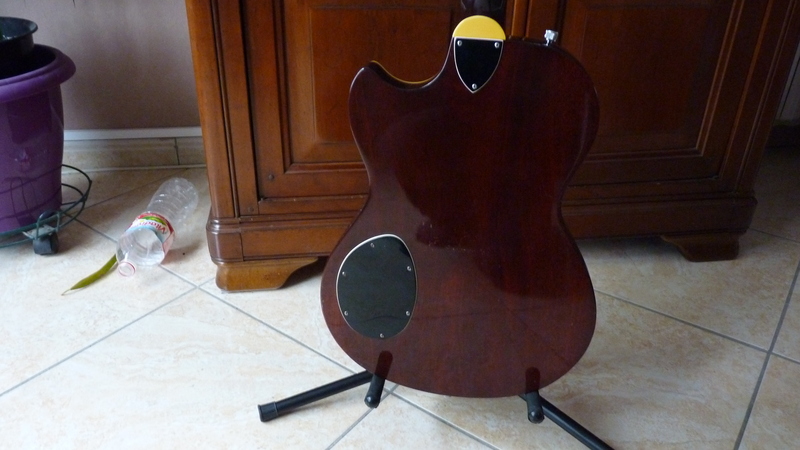 And the only other slight problem is the paint work, the black surround of the footswitch gets scratched easily. This is a great pedal for anyone wanting to get a really big sound with themselves and their guitarist but still keeping the low end nice and clear. I would definatly recomend this pedal to all those into bands such as Rage Against the Machine, Muse etc. Bassically any song with bass distortion this thing can emulate quite closely. 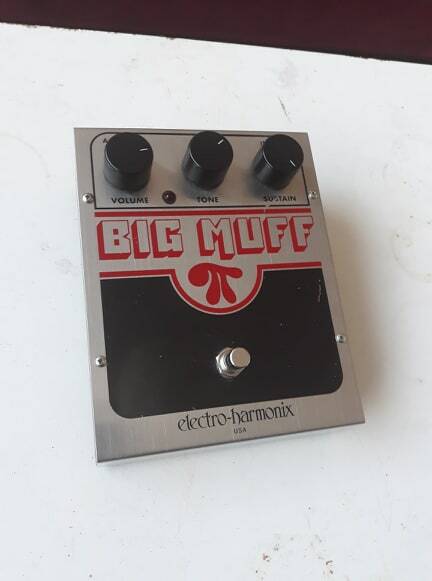 MGR/Rob McCrudden's review"Electro-Harmonix Big Muff"
I bought this unit from Nevada, my local guitar shop in Portsmouth UK. It set me back £89.99. I boughtt it because i was in need of a top quality distortion pedal and i was aware of the big muff's excellent reputation as one of the best that money could buy. It is even featured in album titles (Superfuzz BigMuff by Mudhoney) and T-Shirts (Rock Action T-Shirt by Mogwai) by great bands proving it has a dedicated following! There's very little that i dislike about this unit. The only thing i can say is that i would have prefered it to have been a pedal rather than a push button as this means that you have to wear shoes to use it or you hurt your foot. It's a little annoying if you're just playing at home or if you like to play bear foot at any point (or is that just me?!). But this really is the only thing i can think of that i didn't like and i'm really just splitting hairs here! The construction of the Big Muff is first class. The first thing you'll notice is the sheer size of the pedal. It's huge! I'll bet you it's the biggest pedal you ever seen. But it's not just that its big but flimsy, its made out of metal and the unit is heavy and the dials are big and sturdy giving you confidence to really stamp down on it when you're rocking out. Trust me, you wont break it. And if you do go for the big theatrical stamp when you're playing you wont be let down by a feeble sound coming out of it. It' loud! 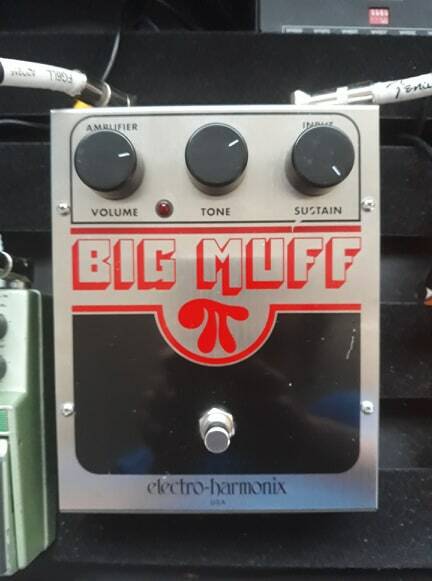 The bottom line is that the Big Muff is a quality unit. There are other pedals out there that you can get pretty decent sounds out of but they're all too small with fiddly buttons and you have to mess around with them for ages to get a decent sound. If you want a great distortion sound with top quality construction (and dont mind paying for it) the Big Muff is your only option. MGR/Jeff's review"Electro-Harmonix Big Muff Pi"
I got this thing off eBay in basically mint condition and even still in the nice classy wooden box it got shipped in for 40 bucks or so. I wanted it because I love the sound of the Smashing Pumpkins' distortion, and this is what they use (sort of, see below). Gorgeous fuzz. Beautifully solid sound when a mid or high single note is played, gotta hear it to know what I mean, and you want to, trust me. The tone control is really really good at changing the sound of the effect. It can pump out warm, thick overdrive or a crispy, nasty higher-end fuzz. Sustain control isn't as versitile, but still can do a LOT to the Tone-controlled sound, giving your guitar better range of possible sounds with just one pedal than I thought possible. So it was pretty good at imitating the Pumpkins' sound. Wasn't nearly as heavy as the Pumpkins' distortion. It lacks the sheer punch that the Pumpkins' distortion dished out. The Sustain isn't nearly as high on this thing as I thought it would be, kinda disappointed with that. Kinda lousy at artificial/pinch harmonics, because (and a bad thing by itself) the gain is pretty low. I've got a DOD Death Metal pedal, so relative to that, it's lousy for loong sustain or huge gain, but I could just have my universe warped by that DOD pedal. It looks tough. It looks like a little tank that could roll around and launch some missles out of the INPUT and OUTPUT jacks (which by the way are left and right respectively, backwards from any other pedal I've used, which makes things a little annoying, but oh well). So anyway, I dropped a speaker on it one day, and now the case is dented, so the metal isn't that strong, it's no tank. And the Sustain control also broke. It got twisted around too far, so now I can move it from minimum to maximum in a 10-degree turn, instead of 350-degree, so that's no good. Everything else is holding up well though. I don't stomp on my pedals though, so I'm not sure how well of a description this is for those of you that do mistreat your pedals. BEST THING ABOUT IT: is it's easy to modify. I haven't done so yet, but everyone on DIY pages have modified their Big Muff into something slightly different. You can't make it a delay or anything, but you can change the sound texture or something like that. Speaking of which, I found out after I got it that the Pumpkins used a Big Muff modified by the little company Sustain Punch, which simply boost (aLOT) the sustain and the punch, appropriately enough, of the pedal. All in all, excellent excellent purchase, especially if you can/want to modify it, you can get exactly what you want out of this baby. Get it, it's worth it if you need a fuzz pedal, even if you don't like the Smashing Pumpkins, but I don't know why you wouldn't like them. 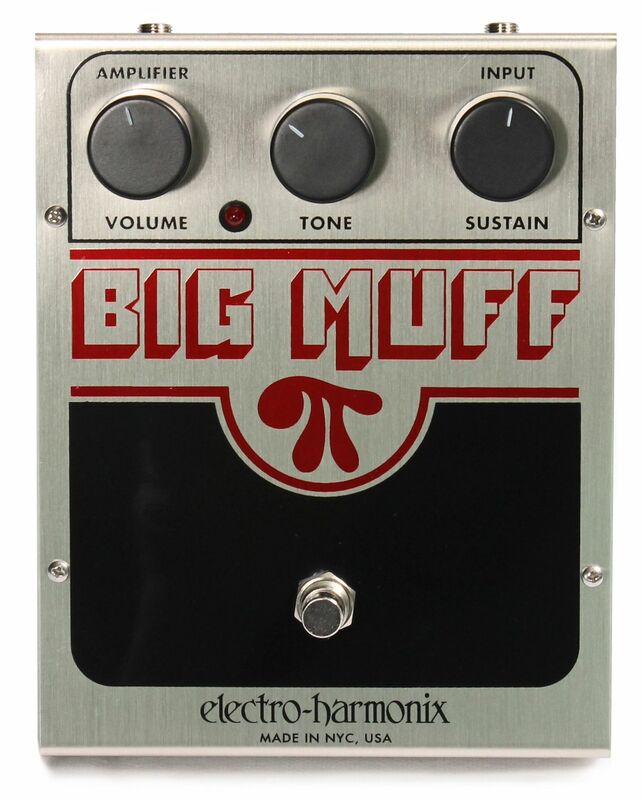 Question about EHX Big Muff?